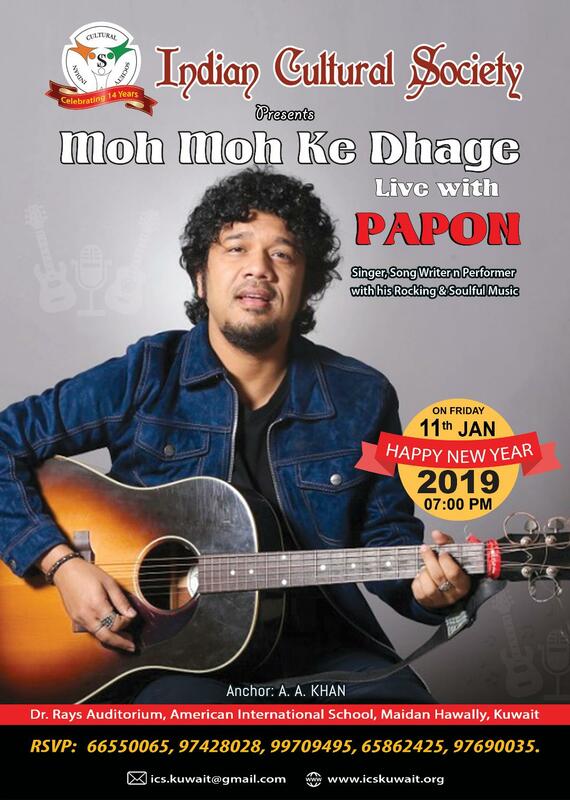 ICS presents “Moh Moh Ke Dhaage” with a multi-instrumentalist, composer, producer, playback singer & rocking performer PAPON (Angaraag Mahanta), On Friday 11th January 2019 at AIS Auditorium at 7.00pm. Papon is one of the most recognizable-and-sought-after voices in India. Papon has a wide variety of influences and considered to be an extremely versatile artist. In the last couple of years, Papon has quickly carved a niche for himself in the world of playback singing. His hit numbers are Moh Moh Ke Dhaage, Kaun Mera, Bulleya, Tu Ji Mila, Sunn Le Re, Khuda Se, Hummein Tummein Jo Tha, Kyon, Humnava, Boitha Maro Re, Har Eik Baat, Naina Laage Re, Tauba, The Story So Far, Ujai Ja Noi, Bhal Pabo Najanilu, in the movie Bobby Jassos Papon sang a duet with Shreya Ghosal. The most recent ones are in the movies Happy Ending, Baby, Hawaizaada, Dum Laga Ke Haisa, Humari Adhuri Kahani, Bajrangi Bhaijaan, Sultan, Barfi, Special 26, Bollywood Diaries, Raid, Befikre, Buno Hansh, Bobby Jasoos, Irada, Tubelight, Madras Café, Sanju, Karwan etc. Papon has seven Assamese albums to his name- two original albums Jonaaki Raati , Sinaki Osinaaki, five folk albums - Rong Phool , Gomseng, Phoolseng which are all Bihu albums and as well as a Holi album Phagunar Gaan. He has released his latest album, Kirili inspired by the festivities of Bihu. Papon was born to a set of brilliant musicians of Assam and was introduced to music and its intricacies at a very early age. His mother Archana Mahanta & father Late Khagen Mahanta were two very popular and respected musicians of the region. His inspirations came from the wide array of sound that he has been exposed to from the traditional Folk songs of Eastern India to Ghazals to new-age Electronica. Papon’s popularity and legend grew after his appearances on all three seasons of Coke Studio India. Papon’s long-standing collaboration with pioneering producers “Midival Punditz” have led to songs he’s co-composed like Har Ek Baat & Naina Laagey finding their way to Bollywood film Soundtrack. Papon hasn’t restricted himself to just Hindi playback singing…he sang for a Tamil movie – Hey for Vanakkam Chennai- and also in Marathi and Bangla movies –a duet with Shreya Ghoshal for a film called Buno Haansh, Jonaki in Lorai etc. 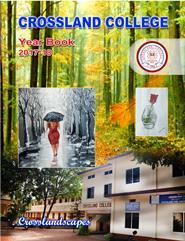 “The Story So far” album was released by TIMES Music & won the GIMA in the Best POP Album category. Papon has received two awards at the JD Rock Awards -‘Best Male Vocalist’ &‘Best Song’ for the feisty folk track Boitha Maro Re. Papon again won the Best POP Album for his episode of Coke Studio Season 3 songs. Papon was declared the best male singer award in the ‘Prag Cine awards’ for the title song Ramdhenu in the Assamese movie “Raamdhenu”. In 2015 Prag Cine Awards, Papon is awarded the Global Icon Award. 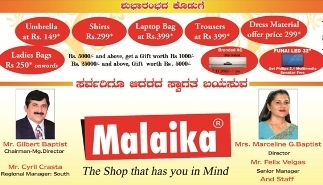 He also felicitated in Filmfare Awards, Zee Cine Awards, and Mirchi Music Awards & IIFA Awards etc. He has won almost all the reputed awards for his song “Moh Moh Ke Dhaage”. In 2017/18 he judge the Hindi singing reality TV show “The Voice India Kids”. Earlier in 2014, he produced an episode of MTV India’s popular TV serial “MTV Unplugged”. He also produced the fourth season of “Coke Studio India” in 2015. PAPON appeared on the several season of musical TV serial “The Dewarists”. His band has performed worldwide, and now in Kuwait. So be witness for Pahadi Songs to Ghazal, Folk music to Film songs, and from series of albums to classical music On Friday 11th January 2019 at 7pm. At- American Int. School Auditorium, Near Police Station, Maidan Hawally. For details to reserve your seats please contact: ics.kuwait@gmail.com or dial/ what’s app: 66550065, 97428028, 99709495, 65862425, and 97690035.